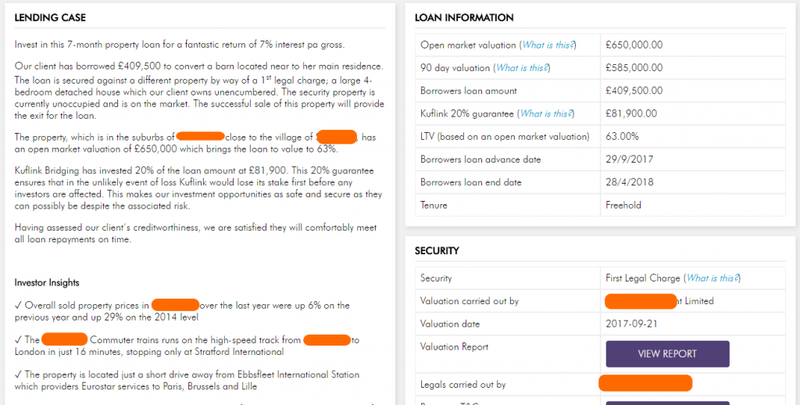 Kuflink are a P2P lending platform which offer investments in UK property development deals. What makes them different is that they invest up to 20% into each loan on a first-loss basis, reducing the risk to investors. Note that this maximum of 20% just applies to the ‘self select’ (manual investing) loans, with only 5% on the automated investment product. Investments are between 6 and 12 months, and offer up to around 7.2% gross (i.e. if there are no defaults). They’ve now funded over £9 million in investments via their platform. Article last update 10th Feb 2019 with the latest Cashback offer details and Secondary Market addition. Expected Returns: 3.99% to 7.2%. The 3.99% is a 1 year fixed rate automated investment, the 7.2% the max self-select investment. Cashback: Yes: £100-£250 for a £500+ investment within 24 hours via this referral link. Although elsewhere the cashback offer has been reduced to £50, Kuflink have confirmed that current/future sign-ups via P2Pblog will still receive the original £100 amount. At the time I opened my account (September 2017) the maximum cashback available was 2.5%. Since then I’ve noticed they offer around 5% via cashback websites like Quidco or Topcashback. In theory these sites work by giving 100% of the referral cashback to you, instead of refer a friend which would be 2.5% to you and 2.5% to the person who referred you. If you want to use these, be careful to click through from a new browser or to clear cookies first so that they can easily match your registration to your click-through from Quidco. The first thing I noticed when I went to the Kuflink website is that the main web domain (‘www.kuflink.co.uk’) does not have a HTTPS certificate. You can see this as it will say ‘not secure’ or something similar in the address bar in your web browser. However, when you go to log in or register it takes you to a separate subdomain ‘invest.kuflink.co.uk’ which does have a proper security certificate. This seems a bit lazy from their IT team. There was no card deposit, so I had to do a bank transfer to deposit funds. I made my first deposit around 6pm on a Saturday evening and it was in my account by 9.30pm the same night. I made my first investment into a funding property at 10pm on the last day of September, and was pleasantly surprised to have my account credited with a few pennies of pro-rata interest the next morning! Since then everything has been straight forward with interest paid promptly on the first of the month. The quantity of ’email spam’ has been reasonable – a single new email for new listed investments and one email about a temporary 3% cashback offer on the automated account. There is an option to download a tax certificate for the standard UK tax year, but no option to change the start dates of the tax year. Its too soon to speak about defaults. I’ve written a basic walk-through of the secondary market process here. Q 1: Are there ‘instant returns’ on new loans (ie. Interest paid from investor funding date rather than end of the funding period)? From my trial investment, I think yes! A: Yes on our Select-Invest deals, which are the individual property loans, interest is paid monthly. And capital it paid back at the end of the term. With our pooled options ( Auto-Invest and our IFISA) interest is paid annually. Q 2: What exactly is the difference between the Kuflink company that takes the 20% stakes in each loan, and the platform itself? I.e. to stop investors worrying that a string of unlucky defaults will bring down the entire platform. A: There are two arms to our business. Kuflink Bridging and Kuflink Limited. As the names might suggest Kuflink Bridging is the lender that prefunds all loans and Limited is our platform. Kuflink Bridging takes the 20% stake. These are two seperately registered companies. I hope this helps to explain the structure/stake. Q 3: If I have an IF ISA – am I limited to the auto invest (and the lower rates) – or can I self-select new loans too? A: Absolutely, you have the freedom to invest through any or all 3 of our investment products. Select-Invest deals pay up to 7.2%. I must note that whilst Kuflink Bridging holds a 20% in Select-Invest deals, the company takes a 5% stake in the pooled options. There are a few options for automated investment, differentiated by loan term and rate of return. Compared to the ‘select-invest’, these have a lower rate of return and apparently a lower first-loss from Kuflink Bridging of 5% as opposed to 20%. There was a little bit of a discussion about this first-loss difference on the P2P Independent Forum, with the response from Kuflink that they ‘wanted to keep the Auto Invest at par with the likes of other similar platforms (Octopus Choice, Brick Lane etc)’. 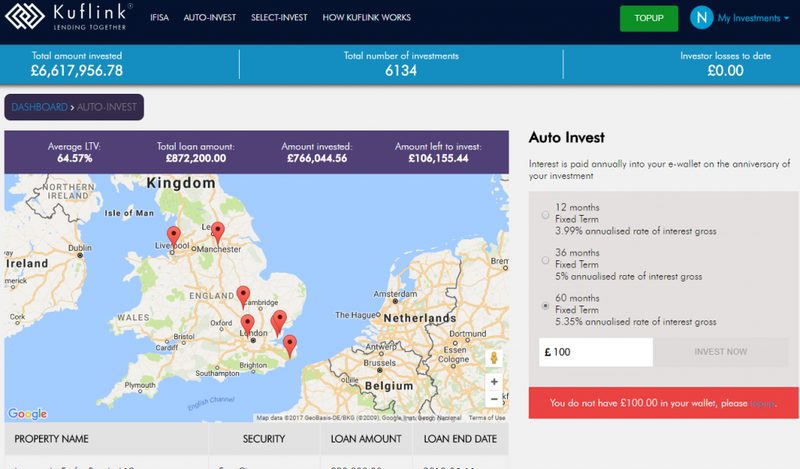 The auto-invest appears to be a collection of 7 property loans on first and second charges. There is no detail on the LTV’s, but their geographic location is marked as in the screenshot above and a loan size given. They include both an open market and 90-day valuation. In most cases the 90-day valuation is less than the open market one. Where I’ve looked they base the LTV from the open-market rather than 90-day valuation. Kuflink is the only peer-to-peer platform in Europe that invests 20% in every deal alongside you. This means that in the unlikely event that a borrower was to default, Kuflink would lose it’s [sic] 20% stake first before any investors are affected. Note that in other places an investment of £500-£999.99 would only attract a £50 cashback, but Kuflink have confirmed that for P2P blog (via this referral link) the lower limit is still valid. The referee will have a 24-hour limit starting from the moment they make their first £100 investment to invest an additional £400 or more. Please double check the terms and conditions to be sure which you will see after clicking through.